MARC STEINER Welcome to The Real News Network. I’m Marc Steiner. Great to have you all with us. On Friday, Trump tweeted a doctored video interspersing snippets of Ilhan Omar speaking before the Council on American-Islamic Relations, known as CAIR, with footage of planes crashing into the World Trade Center and people fleeing in panic for their lives on 9/11. 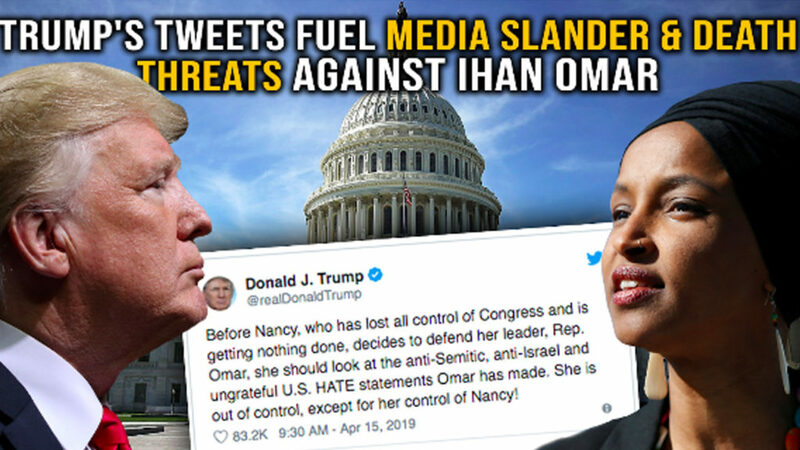 These doctored quotes by Trump and the subsequent attacks by conservative media, like The New York Post and Fox News, led to numerous death threats against Congresswoman Ilhan Omar. This has heightened fears in the Arab American and Muslim American communities and raised the threshold of the political debate in the United States. We’re joined now by James Zogby who is Founder and President of the Arab American Institute and James Zogby, welcome. Good to have you with us. MARC STEINER I’m going to play these two clips back-to-back here. The first thing you’re going to see is the tweet by Trump about Ilhan Omar and then, the next clip you’re going to see is the actual, entire statement of Ilhan Omar when she spoke to CAIR and we’ll watch this now. ILHAN OMAR CAIR was founded after 9/11 because they recognized that some people did something. VIDEO CLIP You have no idea right now. Oh wait, another one. Another plane just hit. ILHAN OMAR Some people did something. VIDEO CLIP Oh my goodness. There is smoke pouring out of the Pentagon. VIDEO CLIP It just flew straight into it. ILHAN OMAR For too long we have lived with the discomfort of being a second-class citizen. And frankly, I’m tired of it and every single Muslim in this country should be tired of it. [applause] CAIR was founded after 9/11 because they recognized that some people did something and that all of us were starting to lose access to our civil liberties so you can’t just say that today someone is looking at me strange, that I am going to try to make myself look pleasant. You have to say, this person is looking at me strange. I am not comfortable with it. I am going to go talk to them and ask them why. Because that is a right you have. MARC STEINER So looking at these two things, James, I’m just curious. Let’s take it from here. Her statement reminded me of something that when Arabs or Jews or Black folks get together and they talk about something that has happened to them in their community. It’s that kind of type of way you phrase things and then, now they’re coming after us. Taking it out of context like this really was a crime in itself. JAMES ZOGBY And you have to understand the broader context. 9/11 was an incredibly painful time for us because our fellow citizens were killed but at the same time, we had to start looking over our shoulder because of death threats. I got some, and many of my colleagues got them, and we catalogued them in a report for the U.S. Civil Rights Commission. The first month, there were hundreds of actual death threats and nine people murdered because they were Arab, Muslim, or perceived to be Arab. And so, it’s almost a protective mechanism to kind of talk about it like, something happened and we all got blamed for it, because it was a traumatic time and a traumatic experience. We wanted to be like other Americans and feel the pain of those who lost their lives in the Twin Towers, but there were some who didn’t let us do that and pulled us away from being American and made us, like I said, look over our shoulders. My daughter in college got threatened because of her relation to me. This is something that was, she was reflecting upon it. But look, they have been targeting her since she went into Congress as a way to create both of an antagonism between Democrats and the Jewish community. But also, their Christian Right base loves it and I think they want to make Ilhan Omar the poster child for the Democratic Party going into 2020. It’s a vicious campaign of incitement against her. It’s an effort to exploit her being Muslim to curry favor with the right-wing base of the of the party and because of the Israel connection, to try to divide American Jews from the Democratic core constituency. It’s vicious. It’s taking a toll on her personally, but also on the broader community. I think it needs to be condemned and I’m pleased that at least some of the presidential candidates have done it, but the party leadership is a little slow to move. MARC STEINER [laughter] There’s nothing new about that. When you look at this, if you see how Trump had his tweet edited to show this kind of fearsome piece that he did to kind of incite hatred against Ilhan Omar really, directly against Muslims, in general. And you also look at these New York Post headlines and what they print up for the New York Post and other newspapers and Fox News, this becomes a real threat to Ilhan Omar, herself. JAMES ZOGBY This is a threat to Omar and a threat to the broader communities. Look, this was a calculated exploitation. They were looking for a phrase to pull out just like they did when she was speaking at Busboys and Poets and talking about not understanding why other members of Congress want her to be loyal to another country. That got taken as she is accusing Jews of dual loyalty. She said nothing of the sort if you look at the whole quote in context. Or the comment about the Benjamins– it was a little flippant, to be sure. MARC STEINER But it was a rap song. It had to do with money. It didn’t have to do with Jews. It had to do with money. JAMES ZOGBY Twitter is about flippancy and that’s its stock-in-trade. If you get used to 140 characters-a-night, if you I got a huge 280, you sort of learn to say things in quick, clever ways. To take that and turn it into something anti-Semitic, or to pretend that it was anti-Semitic, was a calculated, deliberate move to use her, the Muslim, as the poster child so that they could make hay off of it. It was vicious and it has put her at risk. And they are responsible, God forbid, should anything happen to this woman. MARC STEINER There are two things I want to cover here and I’m grateful for our time together. One is what you just said. I think we really need to take seriously this danger to Ilhan Omar and Congresswoman Tlaib, as well, and the Muslim community in America, as a whole. I do want to spend a minute just talking about how serious this threat is and what the dangers are to her, and the dangers are to our Muslim brothers and sisters in this country, and our Arab brothers and sisters in this country. JAMES ZOGBY Yeah look, I’m Arab American. I’ve had death threats literally since 1970, was the first one. I’m starting a trial today of a guy who’s been threatening my life, like people here in my office, for years. Three people have gone to jail since 9/11 for threatening my life. It’s something we live with in this work we do. It’s painful but it’s something that we’ve learned that we have to make do. What we don’t need is the damn President of the United States inciting this kind of bigotry and hatred and that’s what he’s doing. It’s one thing when the folks who would threaten my life would come from— they would get their information from some anti-Arab bigot who writes in one of these crazy websites— but when it’s the President of the United States using the pulpit of the presidency to incite, that’s a very different story and a very dangerous, new development. And I do worry about Arab Americans and American Muslims in this context. It is a frightening time. MARC STEINER So let me try to take a different take on this and see if there’s a positive spin— that’s an incorrect way to put this— but we’re in a very intense moment and a pivotal moment in American political thinking and in America when it comes to Israel, the rights of Palestinians. The majority of Arab Americans and the majority of Jewish Americans who are Democrats and inside the Democratic Party, they usually vote Democratic, for the Democratic Party. Where do we take this do you think? How do we begin a discussion and a struggle that doesn’t become divisive or brings people together to come up with a new way of thinking about where we are? I’m curious what your thoughts are about that. JAMES ZOGBY Well look, I think you’re right to point this out there. There is a polarization in the country, but on the Democratic side, there is an actual coming together of folks. We see it in our polling. We see that for the first time, attitudes towards Arab Americans and Muslim Americans have become net positive. They’ve become net positive over 50 percent because the Democratic numbers are way up. The Republican numbers are way down. So I’m encouraged by the fact that Democrats get it. Independents get it. But I’m very frightened about the fact that the polarization is such that on the Republican side, it’s really ugly out there. And we need a way to bridge that. But frankly, I don’t know how we get there any time soon. So I expect some tough days ahead but on questions related to Israel, look, Netanyahu won. You know what that’s done? It’s created a crisis for people, liberal Jews on the Democratic side, who don’t quite know how to reconcile this image they had of Israel, this romanticized vision of Israel, and the reality that has now been actually reinforced by Netanyahu winning a fifth term. So I expect a robust debate in the Democratic Party. I think we will be able to move further along as we go forward to 2020. But I think on the Republican side, it’s going to get uglier and I would expect it to also be an issue that gets exploited and will have the danger of encouraging violence. MARC STEINER It makes me think back in 76′ when Yitzhak Rabin— not to go over it too much here— made that speech about we are seeing the danger of Israel becoming an apartheid state and we can’t let that happen. He was warning— Yitzhak Rabin, himself was warning— about this in 76′. And so now, we’re in a place that these contradictions are coming home to roost, so to speak, and it may be an opportunity to do something different and at the same time, also defending Ilhan Omar and people in the Arab community. JAMES ZOGBY It all does come together because at the base of this, this is not classic Islamophobia in the sense that there are people— certainly there are people in the Christian Right who have this thing about Muslims in general and about Islam as a religion, it’s a faith-based thing. But for most people who are purveyors of this anti-Muslim hatred, it has to do with the Middle East. It has to do with the Arab-Israeli conflict. It has to do with exploiting that issue as a way of affirming their position on Israel. So yeah, I think that these do come together and we should have a fascinating conversation moving forward, at least on the Democratic side. And I think that where Bernie was alone in in in 2016, I don’t expect him to be alone this year. MARC STEINER James Zogby, I deeply appreciate you taking the time with us here on The Real News today. JAMES ZOGBY Thank you so much for the time. MARC STEINER Thank you. And Marc Steiner here for The Real News Network. Thank you all for joining us. Take care.